Sadly, the street level has been destroyed and the limestone of the second and third floors has been clownishly painted. When William Waldorf Astor demolished the brownstone mansion his father had built on Fifth Avenue the corner of 33rd Street to erect the Waldorf Hotel in 1893, the first domino fell that would lead to the end of the most exclusive residential neighborhood in Manhattan. Caroline Astor followed suit the following year, razing her home and building the Astoria Hotel. The merged Waldorf-Astoria was the supreme hotel in New York but its presence, the first of the commercial intrusions in the area, was unwelcome among the wealthy homeowners. One-by-one grand mansions were converted to business purposes or demolished as New York’s millionaires fled northward. Along 35th Street, between 5th and 6th Avenues, other hotels, both transient and residential, arose. Within just a few years of the opening of the Waldorf refined brownstone residences would be replaced by The Oakdale Hotel and The Hotel Collingwood. They would be joined in 1903 by the Gregorian. Developer Henry J. Braker bought the residence at No. 38 West 35th Street and commissioned architect Clarence True to design a small, elegant hotel. True, who had busied himself for the past decade designing homes and commercial buildings on the Upper West Side, produced a brick-and-limestone structure with gently bowed bays at the upper stories, reminiscent of some of his rows of private homes uptown. The undulating facade, sadly stripped of most of its architectural detail, was a recurring theme in True's designs. As the structure was rising, Braker leased the hotel to Averill & Gregory, the owners of the fashionable Yates House hotel in Syracuse. The partners agreed that C. S. Averill would remain in Syracuse to handle the Yates while G. F. Gregory would move to Manhattan. The arrangement resulted in the name of the new hotel: The Gregorian. The hotel opened on January 2, 1903. 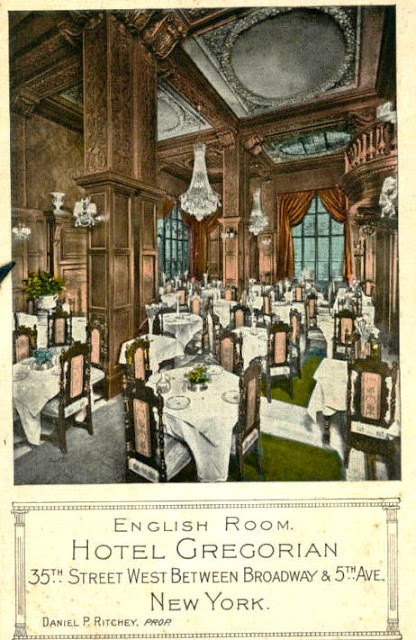 The New York Tribune reported that “The new hotel is elaborately decorated, especially the restaurant and reception rooms, on the ground floor.” In an effort to lure well-to-do guests who might not want the commotion and expense of the immense Waldorf-Astoria a block away, True lavished the double-height public rooms with stained glass windows, lit from behind by hidden “electroliers,” massive columns and crystal chandeliers. Things did pick up. By May the New York Tribune was calling the hotel “a delightful city summer home” and business was brisk. Henry Braker was so encouraged that he decided to enlarge. In August he leased the home of Dr. E. M. L. Bristol at No. 42 for 21 years at a total cost of $84,000. He now had already acquired No. 40 and now brought in Clarence True once again to triple the size of his original building. For her yellow dinner, which was followed by a theater party, Mrs. Warranier paid $25 per person – a little over $500 today. There was great excitement in the kitchens of the Gregorian a month later. In November 1903 the chefs received a shipment of live terrapins from the South which were to become terrapin soup. One of the chefs, Louis, who was an admirer of Grover Cleveland, noticed that one turtle had the initials “G.C.” and the date “1893” carved into its shell. And so the chefs read up about turtles and incubators and concocted a tin pan filled with sand for the eggs, which were kept at a constant 78 to 80 degrees. Then, at around 4 a.m. on January 20, 1904, Louis woke up the staff by “dancing around the kitchen and yelling like a South Sea Islander,” according to The Times. All of the staff rushed to the kitchen and several of the guests came downstairs, concerned about the commotion. One guest, a Mrs. Colwell of Stamford, Connecticut, had an especially unfortunate shopping trip on December 6, 1905. She left the hotel with approximately $3,000 worth of jewelry in her purse. Unknown to her, there was a large hole in the bottom of her bag and as she progressed along 5th Avenue, the jewels dropped one-by-one onto the sidewalk. Mrs. Colwell returned to Connecticut with less jewelry and more common sense. 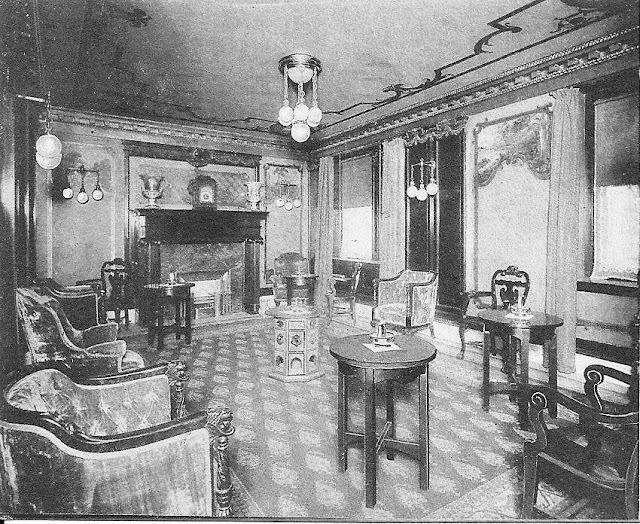 This postcard view of a sitting room, called the Purple Room, was taken about the time that Mrs. Colwell lost her jewelry. Tragedy struck the Gregorian on August 25, 1906. Elevator operator William White was slowly moving the cage up as two porters rode on the top, wiping the walls of the shaft. Adjoining the passenger shaft was the shaft of the freight elevator. When White’s elevator suddenly stopped at the 8th floor, he opened the door to the freight elevator shaft and looked in, trying to discern the problem. At that moment the freight elevator, being run by Thomas Murphy, was descending and struck White on the head, pinning him down. White’s cries were heard throughout the building and Murphy quickly reversed the direction of the freight car. White plunged headfirst down the elevator shaft to his death. Oddly, Murphy was arrested and held at $1000 bail, charged with homicide. Gregory furnished the bail for his employee. Along with the transient guests, the Gregorian was home to wealthy, permanent residents as well. Among them was John Richmond Gibb , a partner in the Loeser & Co. department store in Brooklyn. Gibb and his family also had a country estate at Islip, Long Island. With the wedding approaching, Davis gave his intended $8,000 to purchase her trousseau. Everything seemed to be going well until about a week before the ceremony. Helen handed Davis an $11,000 diamond necklace on Thursday, December 6. The mine owner was to sell it to a guest at the Waldorf-Astoria, then bring the money back to Helen at the Hotel Gotham. Instead, Davis stormed into the hotel around 8:00 that night informing her he was breaking the engagement and keeping the necklace until she returned his $8,000. Louis A. Prince was living in “expensive apartments” in the Gregorian in November 1908 when he was arrested along with his partner J. Walter Labaree “on a charge of operating a $500,000 swindle.” The pair was selling stock in the “Dos Estrellas Mines” in Mexico, representing them “to be worth fabulous sums,” according to The New York Times. When postal inspectors traveled to Mexico to investigate, they found the mines abandoned and worthless. The hotel was briefly threatened in 1910 when Mayor Gaynor suggested cutting a new avenue between 5th and 6th Avenues from 14th Street to 59th Street. The new thoroughfare would cut directly through the site of the Gregorian. City officials apparently rethought the proposal that would have demolished $50 million worth of property and cost several million more to complete. On the highest floors True's architectural details survive. On October 12, 1910 Charles Gilbert died suddenly in the Hotel Gregorian from an abscess in the ear. Several of the singers of the Metropolitan Opera House participated in his funeral service, prior to his body being returned to France. Tenants could expect to pay $50 a month for a single room with bath; while family suites and private bath cost $100 and up. Some of the hotel lobby detailing survives. The problem was that she did not have the money. So when she was caught having embezzled several thousand dollars from a former employee, he agreed not to press charges if she would return the money. The solution was simple: she would steal the money from the Gregorian. 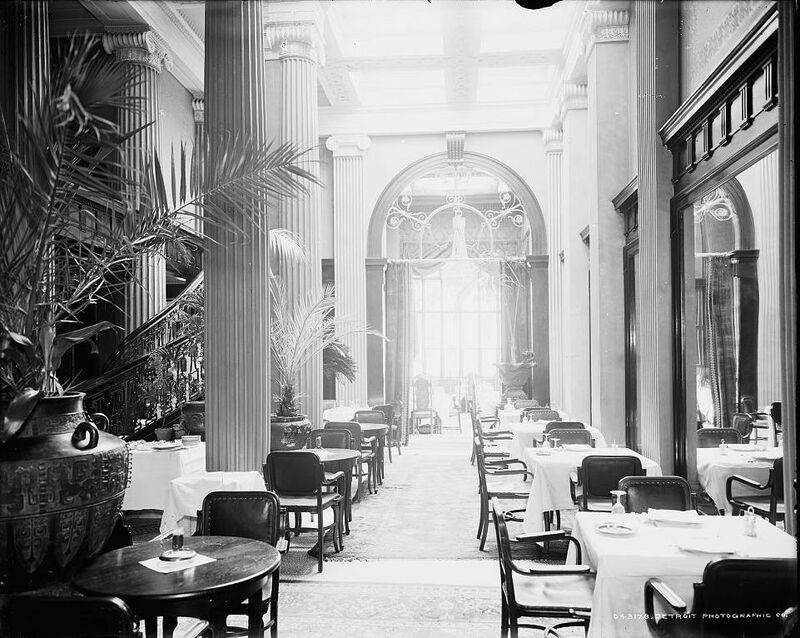 Remnants of the Palm Court still exist as a bar-restaurant. The Gregorian became the venue for the annual pedigree dog shows of the American Kennel Club, the Boston Terrier Club of New York and other organizations. Year after year the hotel became home to dog owners and dogs alike. The glory days of the Gregorian Hotel would last a few more years. In the 1920s Mrs. Fannie Miller lived here with a private stock ticker in her rooms. But times change, and West 35th Street suffered a decline in the middle of the 20th century. The once-proud hotels became little more than flop houses and the commercial buildings were taken over as industrial lofts and small businesses. Sometime around mid-century the facade was stripped of nearly all of its ornamental detailing. 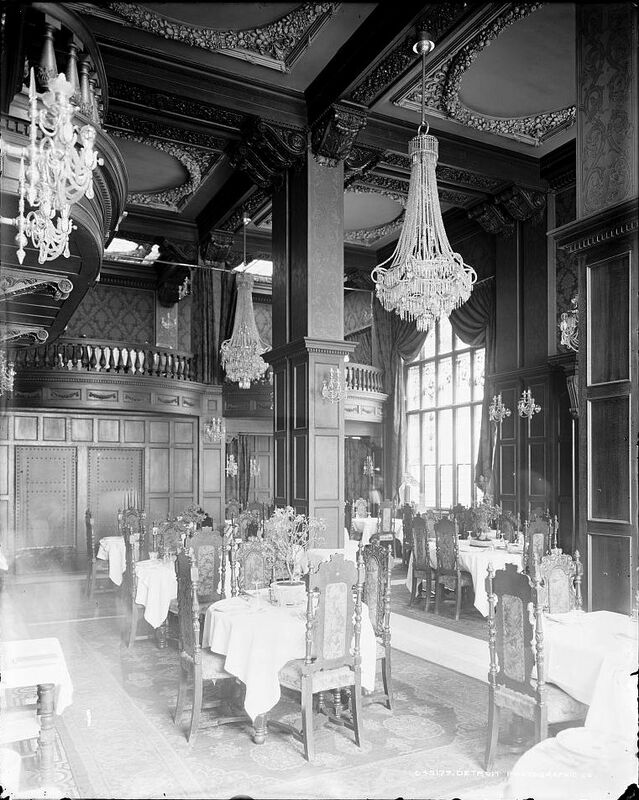 The main dining room as it appears today. But the street underwent a renaissance as the 21st century approached. Comfort Inn took over the old Gregorian, giving it a make-over that caters to businessmen and tourist families. An Irish pub and restaurant is installed in one-third of the ground floor where much of Clarence True’s grand interiors still survive. The hotel really looked beautiful in its earliest days and still remains to be an awesome place.. This is just an amazing enchanting Vintage hotel. Just loved the interiors. have noticed the Hotel Wolcott on 4 west 31st st. interesting and pretty much the same exterior, fascinating lobby and i am told an existing unchanged 1903 ballroom. My grandfather and his partners operated both the Hotel Wolcott and the Gregorian. He changed the Gregorian's name to the "New Murray Hill Hotel" when the old Murray Hill on Park Avenue, which he also operated, closed down. Thank you so much for taking the time to write about these wonderful old palces.